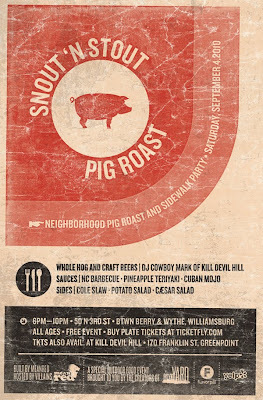 Amylulita says...: 2NITE in Brooklyn - SNOUT n' STOUT North Carolina-style pig roast & sidewalk party! 2NITE in Brooklyn - SNOUT n' STOUT North Carolina-style pig roast & sidewalk party! Tonight, Wed, Sept 4th I'm producing an awesome event w/ MeanRed Productions called SNOUT n' STOUT. They are rolling up the gates of a building on North 3rd in Williamsburg for an open-air, North Carolina-style pig roast & sidewalk party...sorry to my vegetarian friends, but I LOVE meat, haha! Join us for a plateful of goodness (courtesy of Woody’s Pig Roast), craft beers, music, friends, & fam. All are welcome to come, hang out, drink beer, but only folks who buy advanced tix will get a plate ‘o finger lickin food. So make sure to buy your tix online. Whole Hog with three sauces (NC barbecue, Pineapple teriyaki, and Cuban mojo), Cole Slaw, Potato Salad, Caesar Salad or Fruit Salad.